In our previous posts in this series we aimed to understand the difficulties confronted by police reform in Venezuela. We showed that most Venezuelans do not blame the government or ineffective policing for Venezuela’s crime surge in recent years, and are more likely to point to social and cultural causes. We also showed that people think “improving family values” would be more effective in fighting crime than any other measure. Nevertheless, we did find considerable support for professionalization of police forces, much more than for the deployment of military forces. In this post we look at how Venezuelans evaluate the security reforms that have been put in place by the government, including human rights oriented police tactics. In the past few years the Government has put various citizen security reforms in place, including the Police Reform and the Presidential Disarmament Commission. Which of the following opinions is closest to your own? 14% of the respondents answered that the reforms are good and 31% responded that they are good but are long-term solutions. Combining these two responses, we see that a slight majority of respondents who were familiar with the reforms viewed them positively (45%). 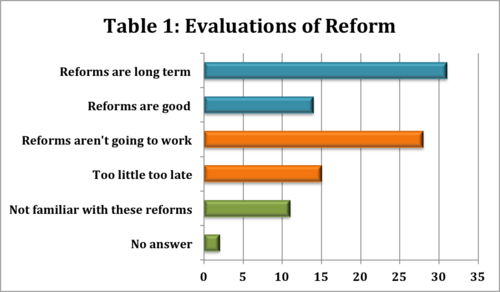 Nevertheless, 43% of respondents answered that reforms were too little too late or would not work. Given that the margin of error of the poll is around 2.5%, this is a statistical toss-up. When broken down by political affiliation, we can see that the positive assessments of the reforms are heavily dependent upon government supporters. When broken down by political affiliation, 76% of government supporters positively evaluated reforms, whereas only 15% answered that reforms were not enough or would not work. Out of those who identified as opposition, only 18% assessed reforms positively and 73% assessed them negatively. This is most likely the result of Venezuela’s political polarization. Most measures that were identified with the Chavez government or are now identified with the Maduro government will be viewed negatively by the opposition and viewed positively by government supporters, regardless of their content. However, it could also be due to the fact that the government garners much of its support from those who live in poor sectors, which often suffer from higher rates of crime. It could be that these people support the global idea of security reform because they think it could reduce the crime they are subjected to. In a future analysis we hope to break this down by socio-economic class in order to see if this is at play. This question is important in gauging perceptions of reform because since 2009 police reform has placed heavy emphasis on dialogue, human rights training and most importantly, the progressive and differential use of force. For example, new policing norms no longer allow officers to shoot at fleeing suspects as they traditionally have done. Indeed here we see 42% of respondents agreed with this statement while 35% disagreed. When broken down by political affiliation government supporters are actually more likely to agree (49%) than disagree (26%) that restricting the police officer’s use of force reduces their ability to fight crime. 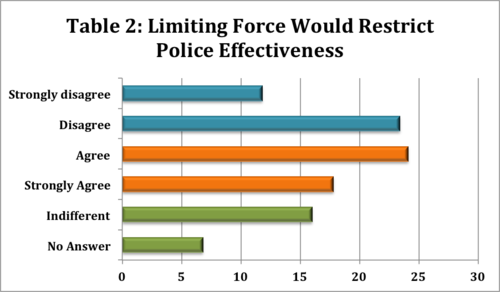 In contrast, government opponents were less likely to agree (38%) that unrestricted force was necessary to fight crime than disagree (45%) with this statement. We consulted with Venezuelan political scientist Ana Maria Sanjuan who suggested that this was consistent with research she had done. Government supporters are more likely to live in areas with high crime rates and are more like to think mano dura police tactics are the only way to be effective. These findings show the tightrope that reformers have had to walk in attempting to push forward with reforms. The social sectors that are most open to the actual contents of police reform oppose the government and everything it does. The social sectors that tend to support the government tend not to support the actual contents of many of the reforms; instead they tend towards favoring the mano dura policies that reformers are attempting to move away from.